Killer Characters: Tea with the Queen? Yes, Please! Tea with the Queen? Yes, Please! Hi! 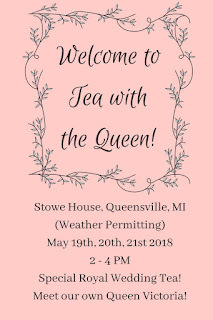 Welcome to Queensville, Michigan's annual Tea with the Queen event, held every year on the weekend of the Canadian Victoria Day weekend. Look at all your wonderful hats... are you wearing them in honor of the royal wedding? Aha, I thought so! How many in your party? Five? I've got a table for you right over here near the lilacs on the lawn of our beautiful Stowe House... the last time we'll be holding it here! Next year the event will be moving to the lawn of Queensville Heritage Manor. What's that you say? Oh, yes, wasn't the royal wedding wonderful? Meghan Markle... I mean, Her Grace, the Duchess of Sussex... was so lovely; her dress was really simple, but it made her the star, and I liked that. Harry was so happy and handsome! I did wonder if he'd keep the beard, and he did! Loved the gospel choir, and the American touches. But still so British! Right... tea! 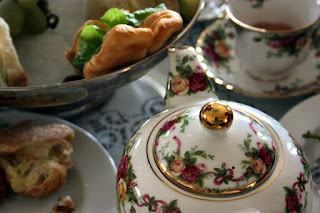 We serve tea in individual pots with a variety of real bone china cups that you can buy after tea, if you like, and you have the option of a full on tea for the whole table, with macrons, cookies, finger sandwiches, lovely Tansy Tarts butter tarts - you Canadians know all about butter tarts! - and my own cranberry lemon scones with... pardon me? Oh, yes, well... we don't have clotted cream, exactly, but a lovely creme fraiche. No, I agree, not the same thing, but we have to make do. No one was willing to make the clotted cream; too much trouble. You can also just have the tea and scones, if you like. 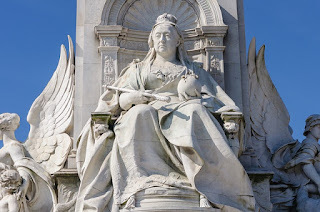 Yes, that's Mrs. Trelawney Bellwood playing the part of Queen Victoria today; yesterday was Imogene Frump's turn. They've started trading off now. The little tiny girl with her, dressed in the frothy white dress, who is playing one of Queen Victoria's granddaughters, is my daughter Jocie! Isn't she the most adorable little girl? Yes, I'm very lucky. Let me leave you to read over the menu and decide. Wow... we're so busy! I have a moment to speak with you, but just briefly... we've got more people coming by buses, and the ferry from Canada is due any minute! More thirsty Canadians... those folks sure drink a lot of tea! 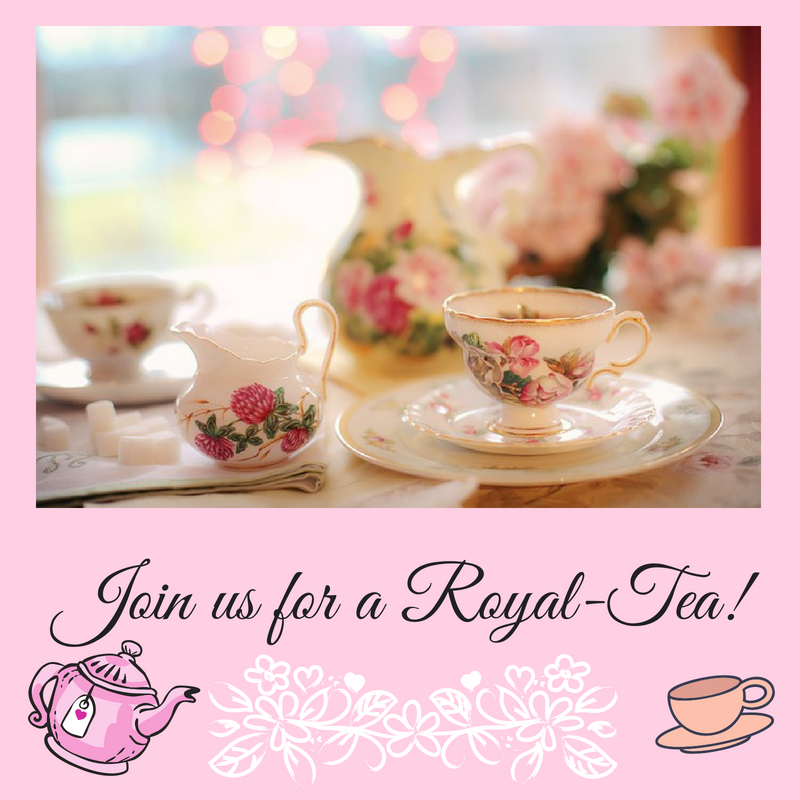 This royal wedding of Prince Harry and Meghan Markle, now the Duchess of Sussex, has created quite the fervor for our Tea with the Queen event, and we've had national coverage from the media, even! Don't get Mrs. Bellwood... I mean, Queen Victoria, started on the wedding, or she'll talk all day. It's actually one of our two biggest fundraising events of the year for the Queensville Historic Society. We also have Dickens Days in December, when Victorian garbed carolers stroll the village; we have a cider booth, and treats for everyone! Every town has history, and it's all important, the good and the bad. Did you know that the founding father of Queensville, Jonas Perry, was a spice magnate? He imported nutmeg, cinnamon, pepper, coriander... all kinds of spices. I'd better get back to my customers... Hello again! Okay... complete tea for the whole table, wonderful. It'll be coming in just a few minutes. By the way... after you enjoy your tea, head on out to the Queensville Heritage Manor for a tour; I designed the kitchen, and sourced all the vintage kitchen implements. Directions are on your complimentary menu, and entry is included in the price of your tea! You're done? 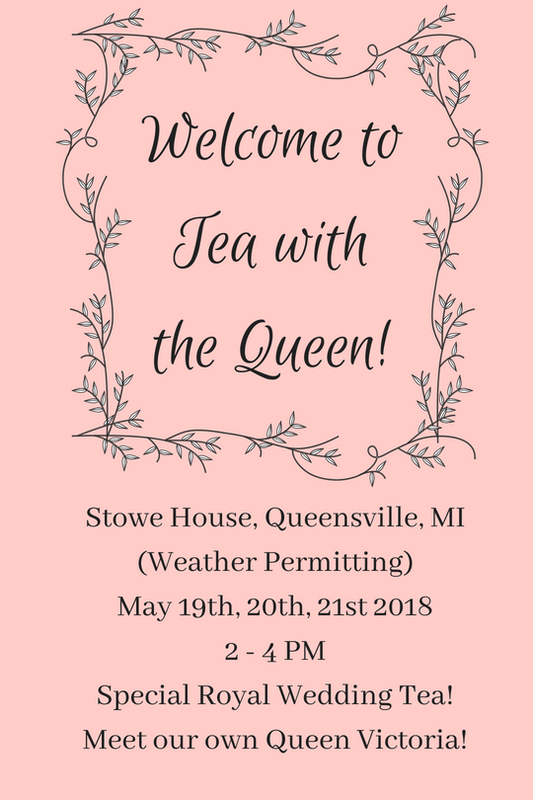 Thank you so much for coming to Tea with the Queen, and we hope we'll see you back in December for Dickens Days in downtown Queensville! BTW... did you enjoy your tea and treats? First... an announcement! No Grater Danger, Vintage Kitchen Mysteries #7, will be out June 19th, 2018! (See below for blurb!) Also, Vintage Kitchen Mysteries #8, Breaking the Mould, will be released later this year in October/November! 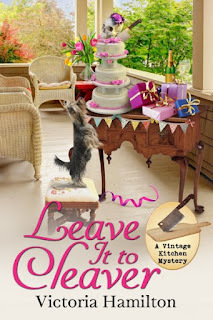 Comment here to win one of three EBOOK editions of Leave It to Cleaver. 2 - Enter by Midnight, May 23rd - Please note... if you comment after midnight May 21st your comment won't show up immediately, but will go into moderation. I'll approve it bright and early the next day! No Grater Danger - Coming June 19th! 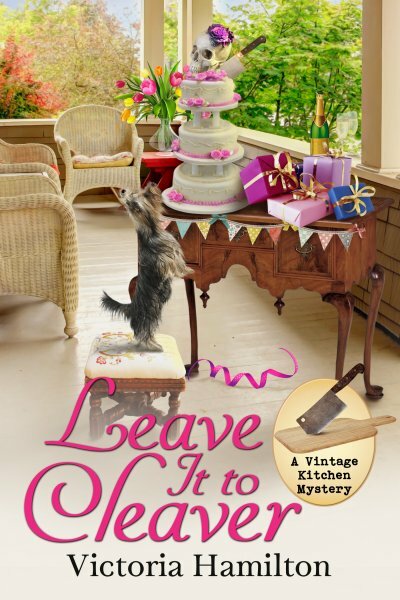 In the brand-new Vintage Kitchen Mystery from the author of Leave It to Cleaver, someone out to spice up their life means to crush a helpless victim . . .
Vintage cookware enthusiast Jaymie Leighton is thrilled at the prospect of meeting an elderly descendant of her town’s founding father, not least because she’s known to possess an enviably large collection of antique spice graters. But the curmudgeonly woman also has substantial real estate holdings, and at the moment she’s engaged in a fierce battle with a property developer who wants her to sell off her old buildings in the name of progress. When Jaymie goes to visit the woman and discovers that there’s been an attempt on her life, she polishes up her sleuthing skills to find out who was behind the foul deed. Her first instinct is to suspect the developer, but as she digs deeper into the case she learns that her older new friend has purportedly been the victim of numerous criminal acts—all of which point to different suspects. Unsure if the stories are true or simply the confused ramblings of a senior citizen, Jaymie sifts through the clues hoping to expose the culprit, but she knows that if she keeps stirring up trouble, she’ll be next on the would-be killer’s list. It would be amazing to have tea with the Queen. Congrats on your releases. What fun it would be to attend a tea like this! I do love this series! Thank you for the contest! Looking forward to reading the new books! I haven’t had the privledge of reading any of these books at this time. Hope to be able to in the future. Love the book covers, the artist side of me feels happy when I look at them. Susan susanmv@comcast.net. Thank you for the giveaway! Congrats on your release. Tea festival- how cool. great to win a copy of Leave it to Cleaver. I love ☕ tea...And I am a royal watcher. Tea,with QE2! Great post. I enjoy tea. The event sounds great. Thank you all for entering! The winners have been notified by email.